It is said that no one truly knows a nation until one has been inside its jails. In the resolution A/RES/70/175, the General Assembly decided to extend the scope of Nelson Mandela International Day, observed each year on 18 July, to be also utilized in order to promote humane conditions of imprisonment; to raise awareness about prisoners being a continuous part of society; to value the work of prison staff as a social service of particular importance. 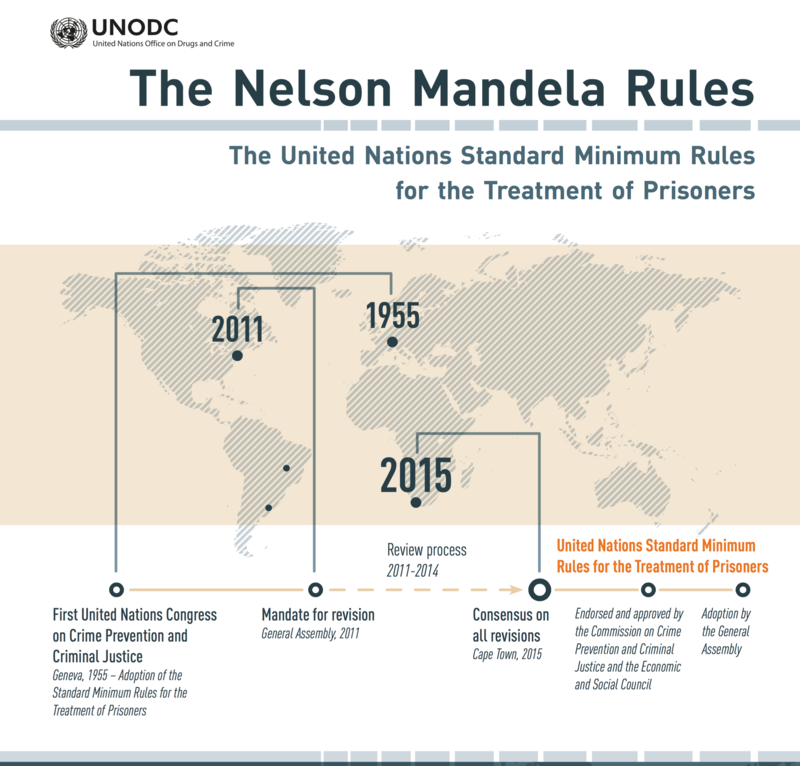 A/RES/70/175 not only adopted the revised United Nations Standard Minimum Rules for the Treatment of Prisoners, but also approved that they should be known as the "Nelson Mandela Rules" in order to honour the legacy of the late President of South Africa, who spent 27 years in prison in the course of his struggle referred to above. The Standard Minimum Rules for the Treatment of Prisoners (PDF ), originally adopted by the First UN Congress on the Prevention of Crime and the Treatment of Offenders in 1955, constitute the universally acknowledged minimum standards for the management of prison facilities and the treatment of prisoners, and have been of tremendous value and influence in the development of prison laws, policies and practices in Member States all over the world. In recognition of the advances in international law and correctional science since 1955, however, the General Assembly decided, in 2011, to establish an open-ended intergovernmental Expert Group to review and possibly revise the rules. Relevant UN bodies, other international and regional organisations, as well as civil society were invited to contribute to the process. As the custodian of the Standard Minimum Rules, the United Nations Office on Drugs and Crime (UNODC) closely accompanied the revision process by serving as its Secretariat. At its fourth meeting held in Cape Town, South Africa, in March 2015, the Expert Group reached consensus on all of the rules opened for revision. In May 2015, the Commission on Crime Prevention and Criminal Justice (CCPCJ) endorsed the revised rules and submitted the entire set of the revised SMRs for approval by the Economic and Social Council (ECOSOC) and subsequent adoption by the General Assembly. In December 2015, the UN General Assembly adopted the revised rules as the “United Nations Standard Minimum Rules for the Treatment of Prisoners”. As per the recommendation of the Expert Group, the revised rules are to be known as "the Nelson Mandela Rules" to honour the legacy of the late President of South Africa, Nelson Rolihlahla Mandela, who spent 27 years in prison in the course of his struggle for global human rights, equality, democracy and the promotion of a culture of peace. and approves that they should be known as the "Nelson Mandela Rules" in honour of the legacy of the late President of South Africa, Nelson Mandela.